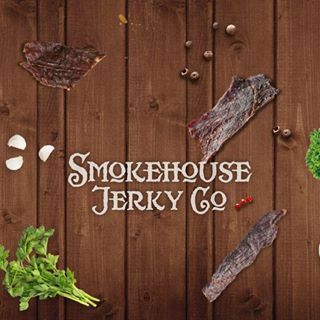 The Smokehouse Jerky Co. brand name was launched in 2008. On January 2/2017, Franco and his wife Patti Fonseca acquired Smokehouse Jerky Co. from Trent Levinson and his wife Barbie. Franco has since added some new flavors, and they have a revamped web site. All Smokehouse Jerky Co. jerky is made in small batches. Tender Heifer Snack Co. are always looking for new distributors across the United States, and they offer private label services, most notably for Knott’s Berry Farm. This jerky is manufactured and distributed by Tender Heifer Snack Co., and they are based out of Beaumont, California. 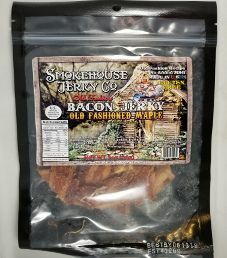 The next review on Smokehouse Jerky Co. will focus on a 2 ounce/56 gram bag of their Old Fashioned Maple bacon jerky. This flavor is described as being an all-original recipe with maple syrup and honey with a smoky sweet taste, and gluten-free being ideal for those who have special dietary conditions. The jerky was graciously submitted for review by one of the owners, Patti Fonseca. Ingredients: Bacon (Water, Salt, Sugar, Smoke Flavoring, Sodium Phosphate, Sodium Erythorbate, Flavoring, Sodium Nitrite), Brown Sugar, Maple Syrup, Honey. This is a standard ingredient list for cured bacon. As a result, the highest ingredient rating that can be awarded is a Good (8/10) rating. While not good, the bacon contains sodium erythorbate and sodium nitrite as preservatives to lose a rating. The liquid marinade used here is comprised of water, healthy locally sourced maple syrup, and healthy locally sourced honey. For a sweet based flavor as we have here, the sugar level is at the upper acceptable limit of 5 grams of sugar per 28 grams of jerky. The salt level is quite high at 650mg of salt per 28 grams of jerky to lose a rating. Admirably, this jerky has no MSG added. These strips of bacon look like any type of bacon that you would buy in the grocery store, and are sliced thin. The texture is dry, to the point where it is slightly crispy. The aroma is of the winning combination of maple syrup and honey. The first taste detected is a good level of maple syrup. Mixed in with that is a delicious sweetness from the honey, and a moderate level of saltiness. 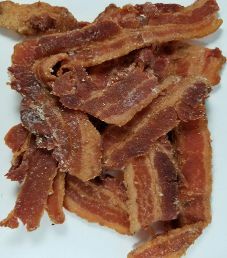 There is plenty of bacon flavor present, and a light level of smokiness that rounds off the flavor. In fairness this flavor tastes exactly on how it is advertised: “with maple syrup and honey – it has a smoky sweet taste that’s made just right; perfect for people who love the distinct flavor of classic bacon jerky”. We however tend to agree with Paul here. While we try not to let our personal biases dictate our taste ratings, we feel that docking a rating here is warranted. Adding something as black pepper or garlic could have gone a long way. You cannot possibly go wrong here if you are pining for tastes of maple syrup and honey, along with the awesomeness of bacon. This 2 ounce/56 gram bag of jerky sells online for 7.99 that equates to $4 an ounce, which rates as an expensive price. Commendably, free shipping is offered on all orders over $25. This resealable plastic bag has a label affixed on the front, and nothing on the back. The label has a fairly detailed picture of a wooden shack, and a pig sitting on a smoker. Some facts printed on this bags are “Old Fashion Recipe”, “No Added MSG”, “No Added Preservatives”, “Made in U.S.A.”, “Old Fashion”, and “Brisket”. Thanks for the great review. Never thought about adding an offset spice to the maple like you mentioned and we do with our honey pepper bacon. I’ll have to bring this up when I see both girls tomorrow . 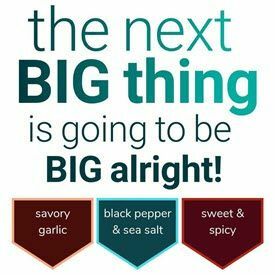 Keep in mind that we are black pepper addicts here at Jerky Ingredients.